For Months, a building in the Ukraine has been destroying the internet, free speech, anything opposing Hillary Clinton and wrecking havoc across the planet. The building is located in a “war zone” so there are more than the usual number of options for such attacks. The building has tons of servers that are programmed as weapons. Citizen Sleuths and IT Forensic peer to peer volunteers have tracked the address of the building and the technical envelope of the structure. The solution can be as simple as a small team of Navy Seals dropping by for a visit or a single Hellfire down the chimney. So far, nobody has done anything. Please let your elected officials know that action is needed: NOW! Contact: Mark Maunder – Wordfence Founder/CEO for the exact address of the structure and refer Senators to Mark for Congressional validation of the serious and costly damages the “Ukraine ion cannon” has harmed the USA with. Last month we introduced a monthly attack activity report. This report gives you an indication of attack trends during the past month and how they have changed. 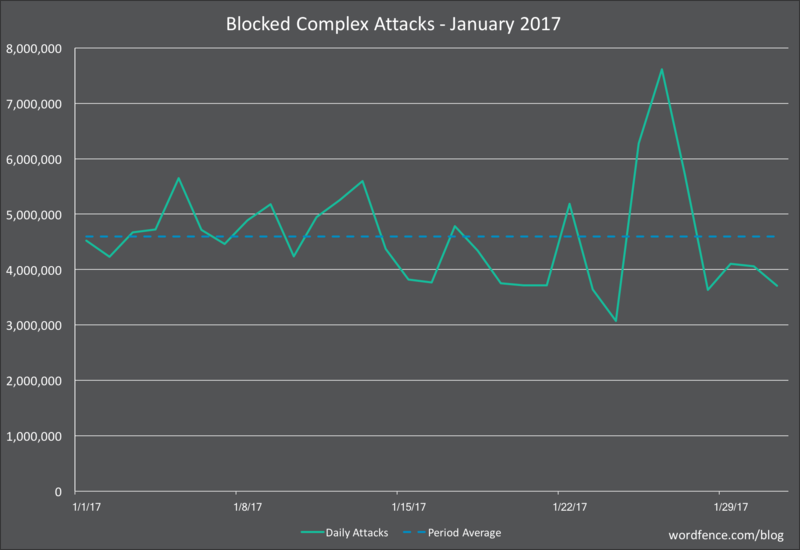 Today we are releasing the January WordPress attack activity report which covers the period from January 1st until January 31st. In the table below we have listed the most active attack IPs for January 2016. Note that the ‘Attacks’ column is in millions and is the total of all attacks that originated from each IP. Further right in the table (you may have to scroll right) we break out the attacks into ‘brute force’ attacks and ‘complex’ attacks. The hostname included is the PTR record (reverse DNS record) that the IP address owner created for their IP, so this is not reliable data but we include it for interest. For example, we have seen PTR records that claim the IP is a Tor exit node, but it is clearly not based on traffic. We also include the country and a country flag. To the far right of the report we show the date in January we started logging attacks and the date attacks stopped. For many of these IPs we logged attacks for the entire month. For some you can see there is a clearly defined attack ‘window’ where the IP started and stopped. The first interesting thing about our January attack data is that the same Ukraine IP holds the number one spot this January as we saw in December. Our top 3 attacking IPs all appeared in last month’s list. However, only 5 of the attacking IP addresses in this month’s top 25 also appeared in last month’s top 25 list. This is an illustration of how the IP addresses that attackers use are rotated out and new ones are used to launch attacks. The Seychelles attacker we saw last month has dropped off the list. In addition, we have Turkey appearing on the list for the first time with three IP addresses hosted at “Yalcin Kanbur trading as Webrano Hosting”, generating over 6 million attacks during January between them. India has also appeared on the list for the first time with an IP hosted at “Reliance Communications” generating around 2 million attacks during January. Last month we saw 66.7 million brute force attacks and 63.9 million complex attacks from our top 25 attacking IPs. You’ll recall that a complex attack is one that targets a plugin, theme or core vulnerability and is blocked by the Wordfence firewall. This month we’re seeing 64.1 million brute force attacks from our top 25 attacking IPs. However, this time around we’re only seeing 34.5 million complex attacks. This change indicates that the most prolific attackers have changed their strategy and are focusing more on brute force WordPress attacks than on trying to exploit vulnerabilities in WordPress core, themes and plugins. The chart above shows the brute force activity on WordPress sites that we saw in January. You’ll notice a huge spike in activity just before the middle of the month. This really gives you an idea of the kind of volatility that can occur. We will occasionally see situations like this where an attacker will gain access to servers that they can use as an attack platform. They will generate a huge amount of activity until their IPs are shut down by the hosting provider or network admin. In December we saw a similar spike but it only peaked at about 46 million attacks per day. In January the peak was approximately 53 million attacks per day. This contributed to an increase in the average attacks per day for January which was 26 million attacks per day compered to 20 million for December. We saw a decrease in attacks on the Wordfence firewall in January 2017. The average number of attacks dropped from 5 million attacks per day in December to 4.7 million attacks per day in January. This decrease in the number of attacks is due to only a single large spike in attack traffic in January compared to a sustained spike in December that lasted more than 1 week. However the number of attacks in January during the low periods was significantly higher than in December with 3.5 million in December compared to 4 million at the lowest activity in January. The table above shows the top 25 plugins that experienced the most attacks during January 2017. The table shows the rank in January, and then the change in ranking compared to December. If you scroll to the far right you can see the number of attacks per plugin during the period. The WP-Mobile-Detector plugin saw the biggest gain in the number of attacks, jumping 25 points in our rankings to position 12. The plugin has been removed from the WordPress plugin repository, probably because a vulnerability was not fixed by the author, and the last review was posted over 7 months ago. The plugin continues to see attacks, which may indicate that some WordPress sites still have this installed and are still vulnerable. It may also simply be because attack toolkits that attempt to exploit multiple vulnerabilities incorporate this exploit and then throw a series of exploits at websites in the hope that one of them works. Let me know in the comments if you have any additional data you’d like to contribute that may indicate reasons for plugin gains or losses in number of attacks, or any other insight you’d like to share. The table above shows attacks we saw on themes in January and we’ve included the change in ranking since December. The rankings for these themes are incredibly stable. The largest change we saw is “linenity” which has a local file inclusion or LFI vulnerability that became public knowledge back in April 2014. The vulnerability allows an attacker to download the wp-config.php file. The stability of the rankings in theme attacks suggests that there is not much innovation among attackers targeting themes for attack. They are likely using the same old attack toolkits that try to exploit the same old theme vulnerabilities and the rankings stay stable as the attack toolkits remain relatively unchanged. In this report for the first time, we are including data on the number of attacks originating in each country. Because this is a new addition to our monthly attack activity report, we won’t have ranking change data for this month. The number of attacks below are the sum of brute force and complex attacks that originate in each country. It’s important to note that this does not indicate that a specific country’s government is launching attacks. Instead this is a general indication of the state of security in each country. The country simply has a large number of servers hosted within it’s borders. This is likely the case with the United States which has the most servers hosted within it’s borders out of any other nation. The country may have a lack of enforcement when complaints are received. In other words, if local law enforcement is lax, there may be malicious hosting providers within the country that are able to act as attack platforms. There may simply be a large hosting provider within the country that has a security problem and is inadvertently providing an attack platform via compromised servers for the rest of the world. That concludes our first Wordfence Attack Activity Report of 2017. As always we welcome you to download the data in the tables above to perform your own analysis and share it here in the comments. Please post any questions or feedback in the comments and as always I will be around to try to answer them. Special thanks to Dan Moen and other Wordfence team members who produced this report and who also tirelessly manage the code and infrastructure that enables us to provide this insight to the community. Previous Post NANCY PELOSI OWNS COVERT STOCK IN FACEBOOK/GOOGLE. DOESN’T GIVE A CRAP ABOUT IMMIGRANTS. JUST WANTS CHEAP LABOR. Next Post Time To Boycott Hollywood and Starbucks, All Year Long!